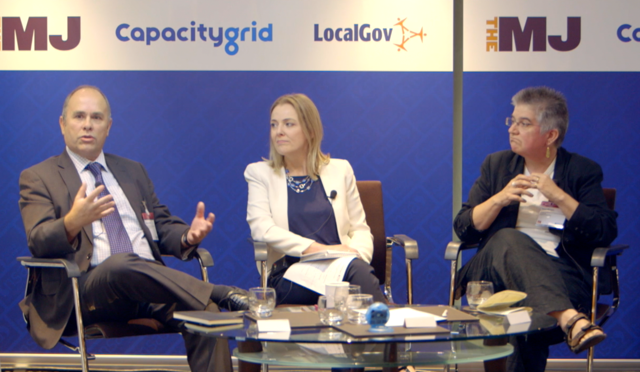 Recently, CapacityGrid sponsored the ‘Powering the North’ briefing in Manchester, the latest event in the City View series presented in conjunction with Policy Review, Neil Stewart Associates, the Municipal Journal and localgov.co.uk. The event was well attended, by local government directors, policy officers and revenue executives, and centred on the opportunities in harnessing the power of data and digital optimisation as local councils transition towards devolution. Discussions also focused on how councils can take advantage of proven data analytics to realise new revenue streams and ensure cost-effective investment into services. The keynote speaker at ‘Powering the North’ was shadow home secretary and Greater Manchester Mayoral candidate, Andy Burnham MP and there were also a series of presentations and ‘Question Time’ style panel discussions facilitated by editor of the Municipal Journal, Heather Jameson. Speakers and panel participants included Alex Gardiner, Associate Director at Metro Dynamics; Aileen Murphie, Director, DCLG & Local Government Value for Money, National Audit Office; Richard Penska, Head of the Support Services Partnership, North Somerset Council; and Deborah Davies, Liberata’s Head of Revenues and Benefits with strategic partner, Burnley Council. Alex Gardiner spoke about the importance of data and how using an evidence-based approach can help councils effectively drive improvements, whilst accurately interpreting the data in a local context, in order to develop more effective place-shaping policies. She praised Greater Manchester’s use of data and commented that more cities needed both “a robust evidence base and sound economics to make the case for change,” in order to enhance both service and efficiency. Picking up on one of the other key themes of the event, Aileen Murphie spoke about the fact that local authorities need to be more data and metric conscious to ensure that resources are being spent on the right projects and investments. Murphie stressed the importance of data modelling around finances, stating that financial directors needed to ensure that the sums don’t just work on day one but that there will still be enough to meet the needs over a 5 year horizon. Deborah Davies, Liberata’s Head of Revenues and Benefits with strategic partner, Burnley Council talked about the changing role of revenues and benefits teams, the need to build relationships and maximise the use of data. She made it clear that their role could no longer be considered to be purely transactional and that they needed to take advantage of proven data analytics to generate additional income, forecast outcomes on a predictive basis, extrapolate policy narrative and identify new opportunities for growth and savings. It was noted that by building relationships across councils and the private sector these teams could enhance the outcomes, as proven recently at Burnley. The more sophisticated and regularly updated the data can be in its provided state, the more beneficial it will be to local authorities. Richard Penska, Head of Support Services Partnership, North Somerset Council focused on the quality of the data and how it will shape the future. For example, data has become really important to the council for making sure its council tax and business rates base is accurate and income is being maximised. Going forward data will become even more important (in providing accurate checks and balances) as councils move to a risk-based verification model (for benefits) where they won’t look to review every customer but instead target certain groups where the data suggests there may be a risk. Videos and further details about the event are available here.